(New Jun 2011) tlTerm 2011 Standalone Now Available! Existing users will receive a free upgrade. New features include more fine-grained privileges, new error check filters, new command-line options, improvements to the Character Information tool, new XML merge options, DTD editor improvements, new Watch Folders functionality, and a tool for deleting all tagged entries at once; more new features still to come! Integration with Word dramatically improves the productivity of translators and terminology practitioners by performing continuous instant lookups of the word at the current cursor position. This also as helps ensure the appropriate and consistent use of standardised terminology. The overlay window includes shortcuts for adding new terms (when not found) or editing existing terms. 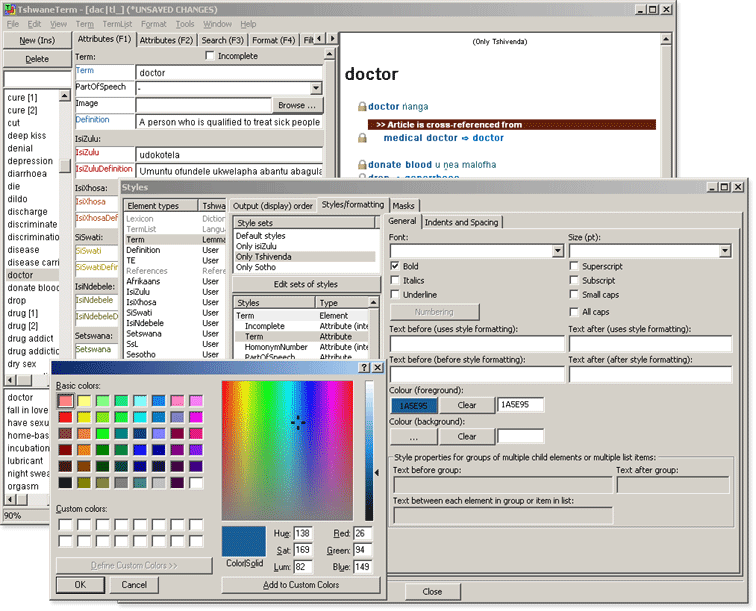 A user-friendly design keeps initial training costs to a minimum, and underscores the principle that users should not need advanced computer literacy skills in order to use sophisticated terminology software. tlTerm automates many tedious aspects of data entry for you, such as automatic numbering and sorting of entries, or finding untranslated terms. A real-time entry preview updates as you edit, and shows you not only the current entry, but those following it, allowing you to quickly view and scroll through the entire terminology database. Multimedia support allows you to link images and sounds (e.g. pronunciation recordings) to entries. Essentially all of the world's languages are supported, thanks to full support for the industry standard international character set Unicode, integrated throughout every aspect of tlTerm. Supports Windows IMEs (Input Method Editors) - data can be entered directly into tlTerm using any of the so-called "soft keyboards" available in Microsoft Windows 2000 or Windows XP, such as those for Chinese, Japanese, Korean or Arabic. 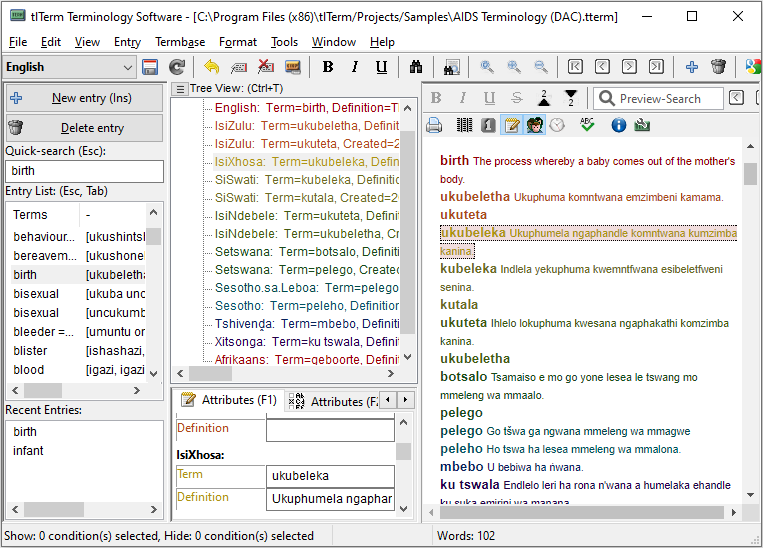 For the South African market, tlTerm also includes built-in standards-based support for easily entering Venda, Afrikaans and Sotho/Tswana diacritics. Our innovative 'sort plug-in' architecture allows fully configurable sorting for any language. 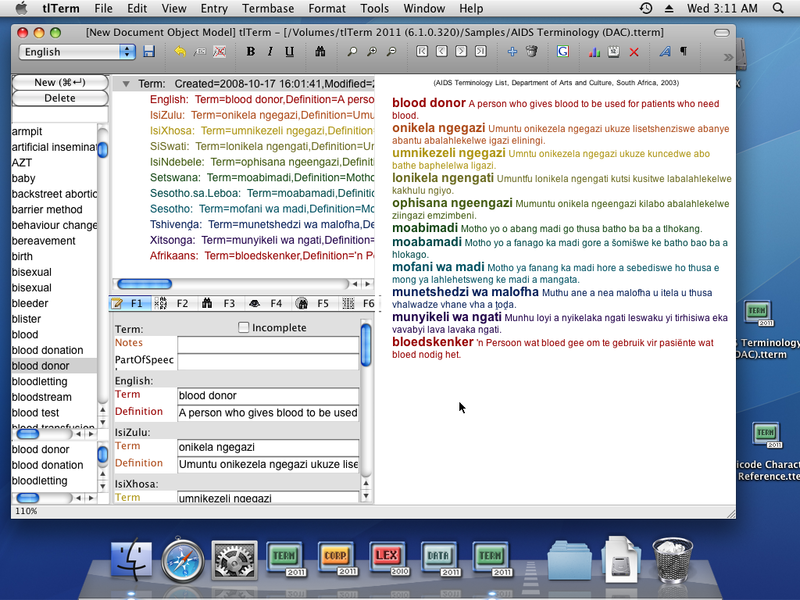 Multi-user support allows a team of users to work on a single terminology database simultaneously. The system keeps track of who edited what and when, and allows managers to track progress of each team member. An entry-locking system prevents changes made by one user from being overwritten by changes made by another user. 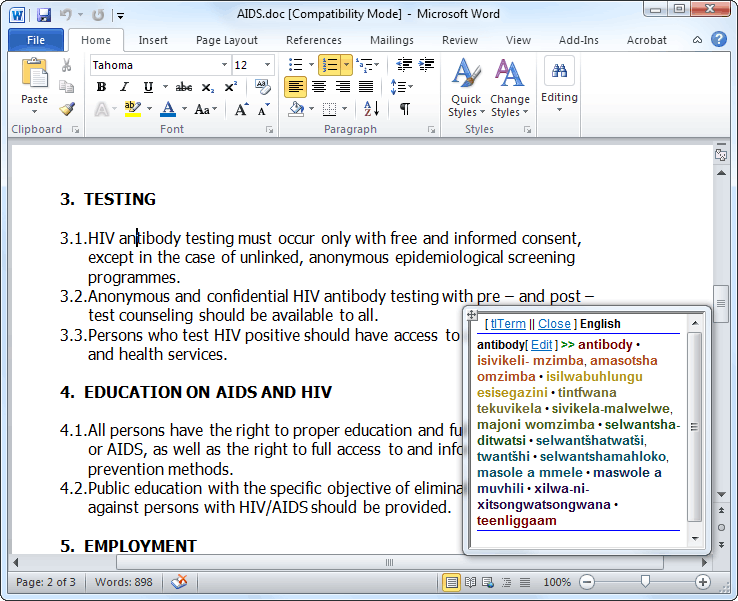 A DTD (Document Type Definition) is used to describe the structure of entries for each particular terminology project. This allows the structure to be fully customised by the user for each project (e.g. which languages to include). The tlTerm DTD system is based on the industry standard XML DTD system. A user-friendly interface, supplemented with detailed documentation, allows end-users to configure their DTD without requiring assistance from an IT expert. A sensible default DTD also allows new users to get "up and running" within minutes, while template DTDsallow custom or standard DTDs to be easily re-used as starting points for new terminology projects. Constraints prevent users from creating invalid entries, thus ensuring consistency throughout the terminology database. Fields may to be restricted to selection from a closed list, e.g. a part of speech list. A comprehensive Styles system allows you to configure all aspects of the visual output of any field. Automatic numbering may be configured for any field. Multiple sets of styles may be defined, allowing multiple editions or 'views' to be generated from the same database, such as print vs. electronic/Web views. Combined with the Filter tool, which allows users to define criteria for viewing or exporting a subset of the data, this can be used to print "sub-dictionaries" from a single database, e.g. 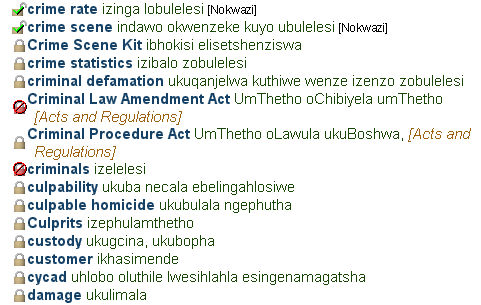 one could select to export all terminology related to a particular field as necessary, or for a particular language or language combination for regional terminology list distribution (for example, one could select to export a 'mini English - isiXhosa dictionary of just election-related terminology'). Export your data to many formats, such as MS Word, OpenOffice, InDesign, XML, HTML or HTML/CSS. Fully-Integrated Corpus: Built-in corpus query functionality integrates directly into your workflow. Customising the language of the metalanguage: Change the language used to display labelling information such as part of speech, usage information and more. A full database search tool allows fast text searches on the entire database, with options such as case-sensitivity or whole-word/partial-word matching. Advanced users may also use regular expressions. The Compare/Merge tool allows different versions of a database to be visually compared with one another. Changes made by a user working at home or otherwise offline from the main database can be easily merged back into the main database. Built-in scripting language allows programmers to interface directly with tlTerm, as well as create "calculation fields", similar in principle to Microsoft Excel formulas. "Term Fanouts" automatically shows entries related to the current one via a shared term. An innovative and powerful Ruler Tool measures and monitors various aspects of progress, such as space allocation across alphabetic sections, providing a unique tool for planning and for ensuring balanced data. Free Reader: tlReader: Freely downloadable application that can be used to view tlTerm termbases, or make them available for use by translators.